Three-storey Villa Grand Cliff Ungasan comprises five ensuite bedrooms, terraces and balconies, a cinema room, 20-metre pool, and jacuzzi deck. The villa is entered via its middle floor, which is also home to a large living/dining room with a bar, and to the pool and pool deck. The two master suites and one guest room are on the top floor. Two more bedrooms and the home cinema can be found on the lower level, which is also home to an open-air jacuzzi tub, a furnished timber deck, and a large relaxation gazebo. 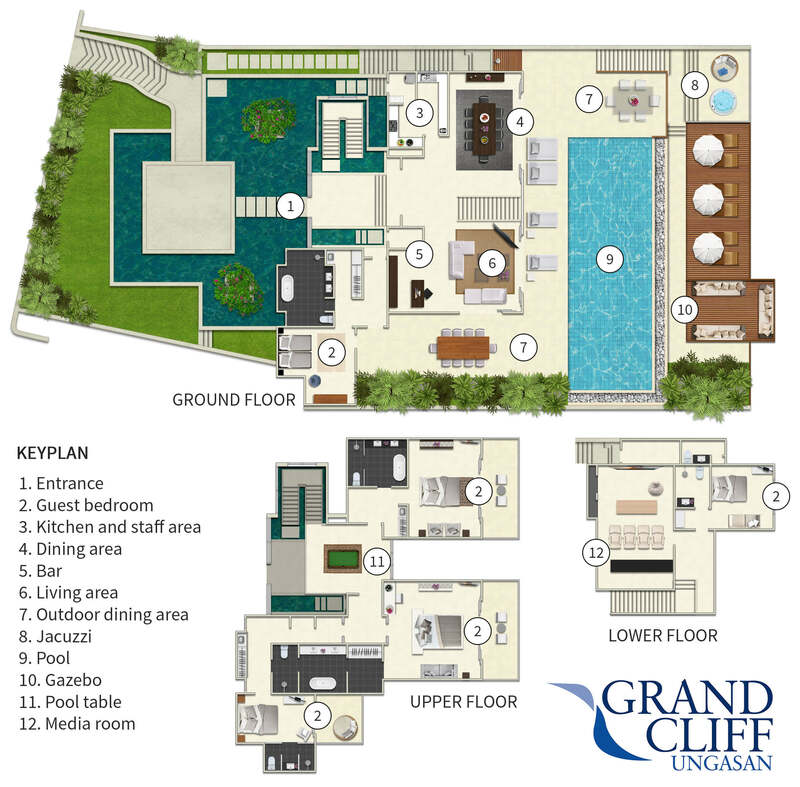 Grand Cliff Ungasan’s entrance door opens onto the villa’s middle level, which is its social hub and home to an expansive glass-fronted living and dining room that spills out onto the sheltered pool terrace. The air-conditioned living area features a bar and a comfy modular sofa positioned around a large international-channel TV complete with a Blu-ray DVD player. A dining table for 12 dominates one side of the room, and is perfect for a social dinner. The best place to watch an epic movie is on the villa’s lower floor, where you will find a dedicated home cinema room equipped with surround-sound; a Nintendo Wii; a Blu-ray DVD player and a massive projector screen. Completed with four leather La-Z-Boy reclining chairs, a plush deep-pile carpet, sound-proofed walls and a bar table, this room is as good as it gets for a real cinematic experience. For less sedentary entertainment, challenge your fellow guests to a game of billiards at the table in the glass-walled atrium on the upper floor. The kitchen is fully equipped for self-catering, which is a blessing if you have kids, and a great opportunity to impress your companions with your cooking skills. Alternatively, you can just sit back, relax and leave it all to your own personal chef. A furnished stone deck borders the 20-metre pool at Villa Grand Cliff Ungasan. This multi-function outdoor space is wired for sound with top-quality speakers. Here, you’ll find two alfresco dining tables – one seating 12, and a more intimate one for eight. Both are ideal for breakfast, a casual lunch, dinner under the stars, or simply for telling stories over cocktails as the sun goes down. If you want to escape from your companions, head down to the villa’s lower level, where you will find a jacuzzi tub, a timber deck, also furnished with sun loungers and umbrellas, and a large relaxation gazebo with cushioned seating. Both the jacuzzi and the gazebo are perched on the edge of the cliff and blessed with magnificent views. The villa’s two air-conditioned master suites are situated on the upper floor, both with walk-through dressing rooms, TVs, and office areas. Each of these bedrooms is a dream in white, ensuring that nothing detracts from the spectacular views of the ocean from the king-size beds. Glass doors open to private balconies furnished with funky chairs. Each master suite features a sophisticated black tiled bathroom with twin washbasins, a soaking tub and a walk-in rain shower. Next to one of the masters is a sitting area and a small guest room furnished with a queen-size bed. Equipped with air-conditioning and a TV, and completed with an ensuite bathroom and a private balcony, this room is ideal for children but also suitable for a couple. Located on the lower floor, furnished with a queen-size bed and adjoined by a bathroom, this suite invites you to enjoy the luxury of the adjacent cinema room, while also tempting you to step directly into the jacuzzi tub on the terrace outside. A quirky feature here is a subterranean window that looks directly into the swimming pool. The sleeping arrangements on the lower floor work well for families with the provision of this second suite, which is furnished with twin beds, equipped with a TV and completed with its own private bathroom.